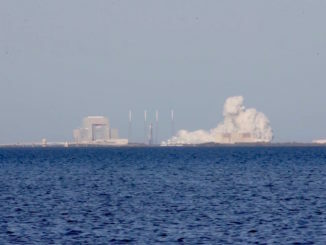 A Falcon 9 rocket booster — under the power of a single Merlin 1D engine — descends toward a specially-outfitted ocean landing platform off Florida’s East Coast on Tuesday in a brief video clip released by SpaceX. The rocket tipped over moments after touching down on the barge, which was parked in the Atlantic Ocean 200 miles east of Jacksonville, Florida. 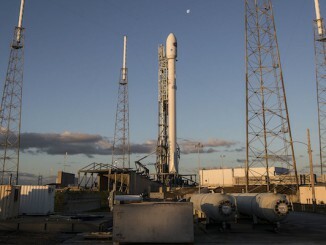 SpaceX says the first stage did not survive the landing. 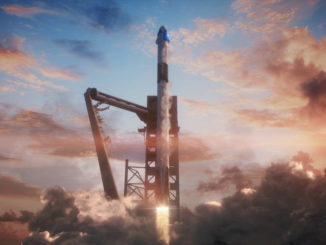 SpaceX is experimenting with recovering Falcon 9 rocket stages in hopes of reusing the boosters on future missions, an achievement officials say would reduce the cost of space launches. The Falcon 9 rocket’s upper stage continued into orbit with an unmanned Dragon supply ship hauling up cargo for the crew on the International Space Station.